Margaret Boles was born in Waterville, Maine in 1939. She was educated in VT, NJ, and Maryland. After marrying at age 20, raising 4 active children, working for Prince George’s County Public Schools for 30 wonderfully adventurous years, she retired to pursue a career in art. Margaret took art classes at Montpelier Mansion, Collington Life Care Center, Bowie Senior Center and Prince George’s Community College. 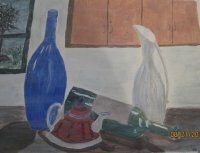 She credits her many teachers with advancing her love for painting, drawing and for helping her grow into a creative expressionist. Margaret hopes to continue learning new ways to express herself in artistic ways.